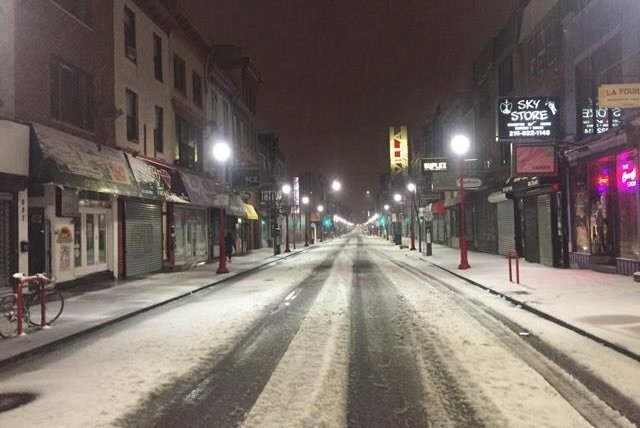 A snowy South Street is empty in the early morning hours of March 14, 2017, as sleet falls during a winter storm. A nor'easter that will move up the Mid-Atlantic coast on Monday night looks like it will spare the Philadelphia region any serious snowfall. 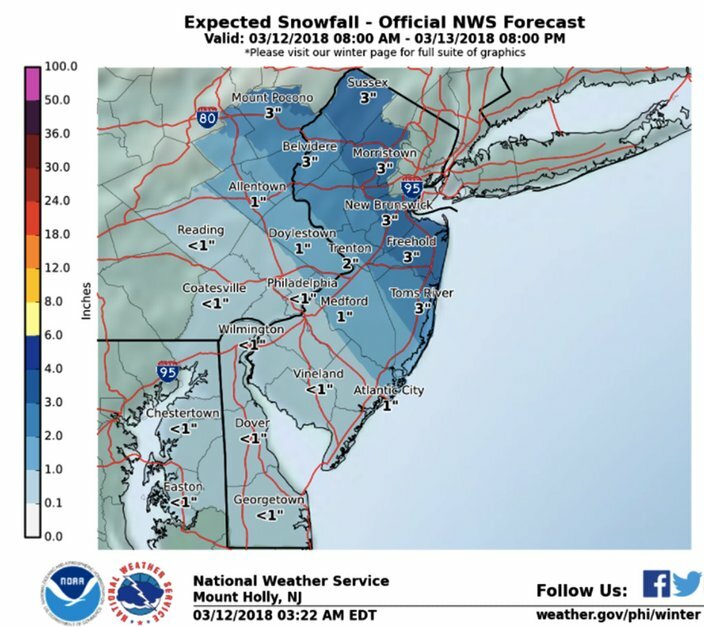 According to the National Weather Service, the current track of the storm will translate to two inches or less of snow in the city, Pennsylvania suburbs and South Jersey. Northern parts of the Jersey Shore could see 3 inches of snow. Forecasters said there remains uncertainty as to the track of the system. If it moves closer to the coast, more snow would accumulate. The precipitation, a result of a low pressure system off the Carolina coast that will strengthen as it moves offshore to the northeast, will likely start as rain Monday afternoon south of the city and move north into the city. Meanwhile, temperatures will continue to drop, enabling a changeover to snow. That changeover could happen around 9 p.m. Monday in Philadelphia, and perhaps an hour earlier in the westernmost parts of Chester County. Winds will remain gusty through Monday and overnight Tuesday for southern and eastern New Jersey, as well as central and southern Delmarva, and will likely begin to gust 20-25 mph by late Monday afternoon. Minor coastal flooding is possible for high tide on Tuesday morning, primarily along the New Jersey shore, Delaware Beaches and shores of the lower Delaware Bay. The risk appears have decreased slightly since Sunday, so an advisory has not yet issued, forecasters said. Gale force wind gusts of 35-40 knots are expected late Monday into Tuesday morning for the Atlantic coastal waters of Delaware and New Jersey, including the lower Delaware Bay. Gale force gusts may linger into Tuesday afternoon. Seas will build to near 10 feet late Monday night. Monday: A chance of rain, mainly after 4 p.m. Cloudy, with a high near 42. Northeast wind around 11 mph. Chance of precipitation is 30 percent. New precipitation amounts of less than a tenth of an inch possible. Monday night: Rain and snow, becoming all snow after 11 p.m. Low around 32. North wind 9 to 11 mph. Chance of precipitation is 80 percent. New snow accumulation of less than one inch possible. Tuesday: A chance of snow or flurries before 8 a.m., then a chance of flurries between 8am and noon. Mostly cloudy, with a high near 47. Northwest wind 14 to 18 mph, with gusts as high as 28 mph. Chance of precipitation is 30 percent. New snow accumulation of less than a half inch possible. Tuesday night: Partly cloudy, with a low around 30. West wind around 11 mph. Wednesday: Scattered snow showers before 1 p.m., then scattered rain showers. Partly sunny, with a high near 41. West wind 13 to 18 mph, with gusts as high as 28 mph. Chance of precipitation is 30 percent. New snow accumulation of less than a half inch possible. Thursday night: Mostly clear, with a low around 29. Friday night: Mostly clear, with a low around 28.